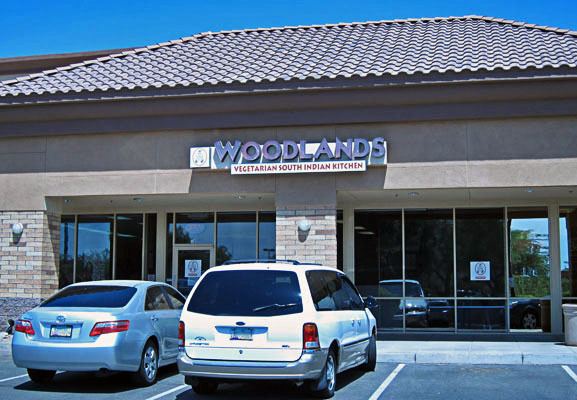 Woodlands Vegetarian South Indian Kitchen in Chandler, Arizona (NE corner of Ray Rd. and S. Rural Rd.) strikes me as a counter-service version of our other favorite 100% vegetarian/vegan Indian restaurant in town, Udupi. Both restaurants feature the less common Southern Indian cuisine, and I believe the previous owner of Udupi now runs Woodlands. They have similar menus, however Woodlands doesn’t have a lunch buffet (but they do have lunch specials). They also do a great job of marking which items are vegan on the menu. The dining experience is much more casual than most other Indian restaurants in town. For instance, your meal is served on Styrofoam plates. However, what Woodlands lacks in pleasantries, it more than makes up for in flavor. 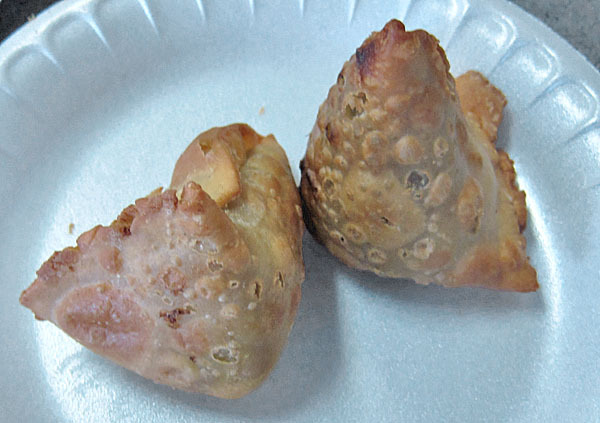 I have a serious weakness for vegetable samosas, and Woodlands serves some of the best in town. They are perfectly fried and, like everything else at Woodlands, very spicy. The filling isn’t unique, it’s just really good. 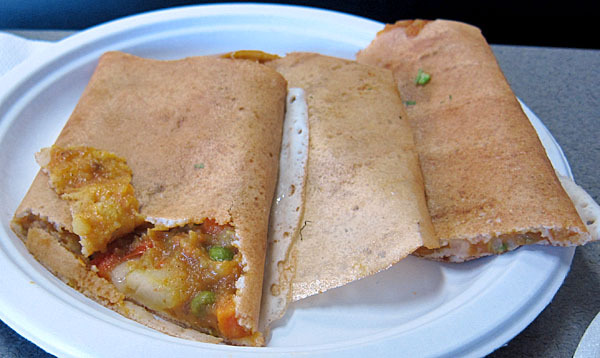 Woodlands’ specialty is the flavorful and interesting South Indian-style dosa (crepes full of a variety of great stuff). My favorite of the ones I’ve tried so far is the Pav Baji Dosai. The filling is a similar to what’s in a standard Masala Dosai, but taken up a notch with spice and, for lack of a better description, “good goo.” I think the goo is essentially a tomato and potato-based gravy, with garlic and chillies added in for good measure. 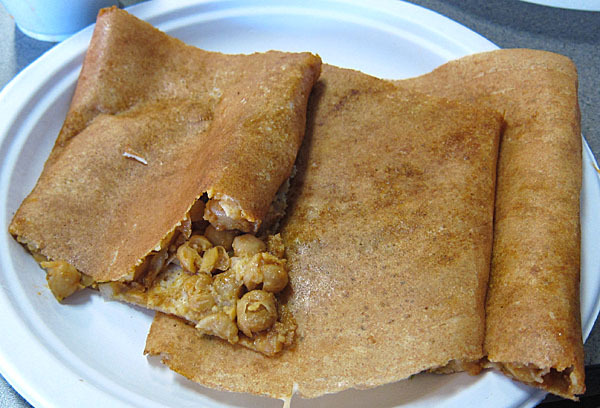 My other favorite is the Chole Dosai, which is filled with a standard spicy chick pea curry and a heavy dose of onions. One time when I had it at Woodlands it was awfully greasy, but on our last visit it was just fine – maybe even a little on the dry side. 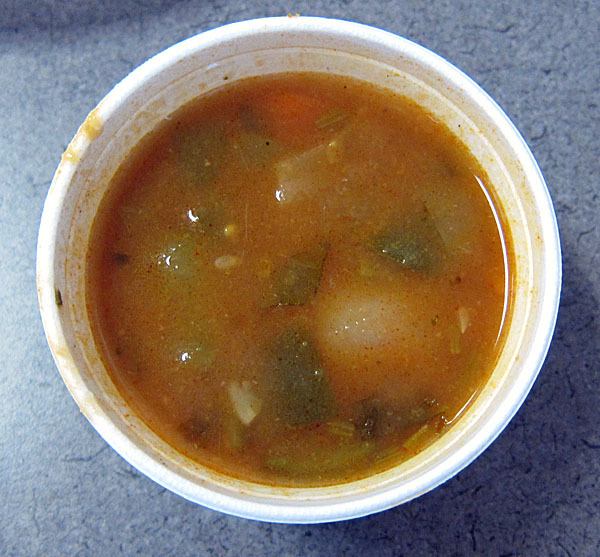 The dosa are served with a standard rasam soup as well, which, like everything else, is very intense. 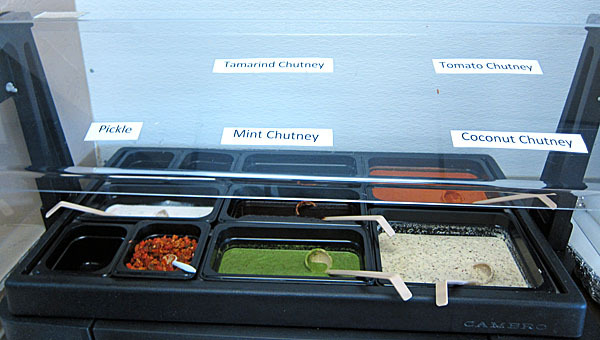 If for some reason the food you ordered isn’t flavorful enough for you, Woodlands also offers a full chutney bar. They don’t have a sign indicating if their mint chutney is vegan or not, but it doesn’t seem like it has yogurt in it to me and it’s so good I’m just not asking (bad vegan of me). Other items I’ve tried include their vegetable curry and dal curry, which were both excellent. I don’t make it to Woodlands very often – mostly because we live too far away, but if you’re in the neighborhood and up for a quick and spicy meal, give them a try! They’re open seven days a week for lunch and dinner. You can also “fan” them on Facebook but they don’t seem to be very active posters. 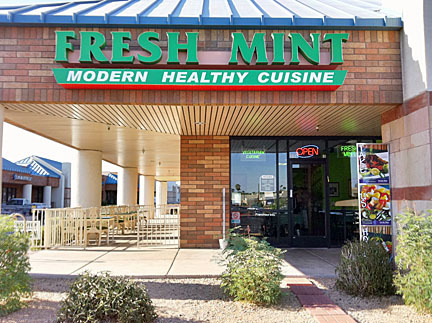 One of our favorite vegetarian restaurants in the greater Phoenix area is Fresh Mint. It’s on the north-west corner of Scottsdale Rd. and Thunderbird, tucked away in a half-empty strip mall. I think they may suffer from not being close enough to ASU to attract the younger crowd like at Green. However, I believe they’ve managed to stay in business throughout the recession based on the quality of their food, the interesting menu and the always excellent service. Fresh Mint is on our “high rotation” list, which means we usually make it there about once a month. The owners are from Hawaii, but most of the menu leans toward Vietnamese, Chinese or Thai flavors. Almost everything on the menu is vegan (except the Fried Imperial Rolls, the Imperial Roll Noodles and I’m not sure about some of the desserts). They use a lot of mock meats and tofu, and some of the sauces can be a bit salty so I wouldn’t say they’re a “uber-health-conscious” restaurant, but most of the items are fairly light and not greasy. They also don’t seem to do “hot” – even the curries are very mellow. On our first visit, we grabbed a to-go menu and started marking each item we tried with a one to five rating. The menu has so much to offer we wanted to keep track of what was best. We haven’t tried everything on the menu yet but we’ve zeroed in on a handful of “fives.” These are the Lemongrass Soy Beef Delight, Golden Soy Chicken Delight, the Fresh Lemongrass Tofu, the Sesame Soybean, the Spicy Ginger Soy Beef and the Vegetable Chow Mein. And be sure to save room for the Banana Fritter — it’s a “five,” and definitely vegan! I normally get one or the other of these because I like their peanut sauce. While some restaurants’ peanut sauces can be spicy, Fresh Mint’s is pretty mellow — it’s thick and slightly sweet. Out of the two, I’d recommend the Cucumber Rolls because they are very unique compared to what you can get at other Asian restaurants. 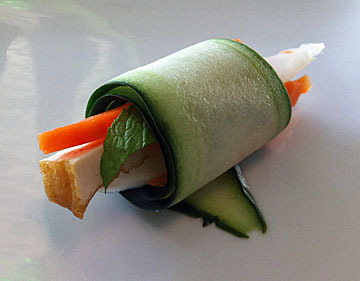 We also had a couple of our favorite entrees – both “fives.” The Fresh Lemongrass Tofu is a totally unique dish. They roll tofu and seaweed together with spices to create crunchy, slightly flaky bite-sized nuggets that are covered in a great sesame ginger sauce. I’ve never had anything like it anywhere else. The only downside is that sometimes the sauce can be a little salty. 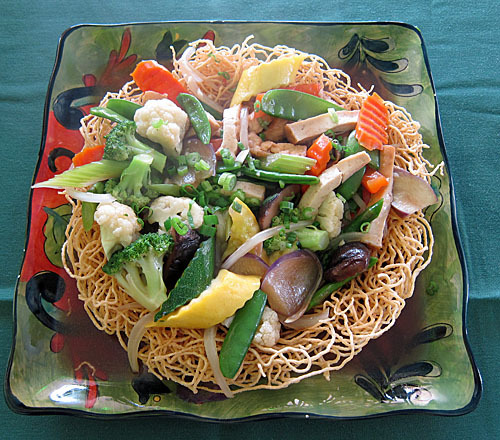 One of my other favorites is the Vegetable Chow Mein. Chow Mein isn’t something I’d normally order on a menu – it sounds so generic and reminds me of when my parents would make Chung King Chinese food from a can. However, since we were making our way through the menu I had to try it and now I’m stuck on it. Fresh Mint’s house brown sauce is very mellow, but delicious. Typically my husband takes whatever he ordered and dips it in my Chow Mein sauce. I also love the crispy noodles when they get just a little bit soggy. Like the Fresh Lemongrass Tofu, it’s very unique. It’s also beautifully served! Although I don’t have a picture of it, I’d also say that you must try the Golden Soy Chicken Delight. They combine ginger and lemongrass to make what they call a “master flavor” and I don’t disagree – it’s masterful! It’s so popular that sometimes they run out of it! For dessert, beyond the Banana Fritters, the Mango Coconut Tapioca and the Plantain with Coconut Sauce are also vegan. But the Banana Fritters are just too good to have anything else. Unfortunately we were too stuffed to have them on our last visit. As I mentioned earlier, the service at Fresh Mint is always impeccable. The restaurant is family owned and run. The husband and owner (I think his name is Michael) typically greets and serves all customers, while his co-owner, wife and executive chef Mai Ly prepares the meals to order. He’s always incredibly friendly but not intrusive, and doesn’t act “too familiar” with regular customers but acknowledges repeat customers with little gifts like Fresh Mint pens and stuffed animals from Hawaii. How could you not love that? I know they’re trying to franchise the restaurant, but I think they need a little help with marketing, like, how about a Twitter feed or Facebook page? I’d also love to see them start offering specials as I have no doubt Mai Ly could come up with some knock-outs using seasonal ingredients.